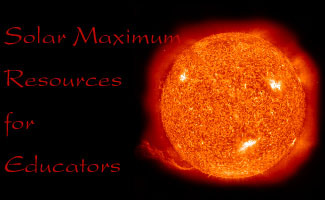 Since it is the goal of this site to educate readers about the solar maximum, we offer the following list of resources for educators to use in their classrooms. Live data, exciting graphics, and interesting lesson plans should all be useful for teachers who want their students to learn about the solar/sunspot cycle and solar maximum. By completing this activity, students find what pattern(s) emerge when sunspot numbers are plotted over a period of time. In this activity, students will plot actual data obtained by astronomers which indicate how bright the so-called Calcium H and K lines are. Students using this activity will look at a timeplot and calculate mean value to determine the sunspot cycle. Students learn to recognize common structures in the images, patterns in five years' worth of images by making graphs, patterns in 250 years' worth of data, comparing to graphs of Part Two, make predictions about the future, recognize spatial relationships by comparing simultaneous images made in different wavelengths, and make testable predictions about the observable Sun. "From Stargazers to Starships" offers a lesson plan on features of the Sun's corona, observed from spacecraft in the extreme ultra violet (EUV) and in x-rays, including coronal holes and coronal mass ejections (CME). This section also discusses related phenomena in interplanetary space and on Earth. This activity has students spreadsheet program to plot the average number of sunspots in a year. This activity for grades 9-12 helps students learn about the solar cycle and its relationship to solar irradiance. Students use a spreadsheet program to look at the number of sunspots observed on days in 1986 and 1989. In this activity, students will construct a graph to compare the sunspot cycle with Coronal Mass Ejections (CMEs). Students will analyze and compare two graphs to determine if there is a correlation between solar activity and ocean temperature. Students will analyze and compare stellar activity graphs to determine how similar or different they are to the solar sunspot cycle. The student will create a list and construct a graph of the number of sunspots using both technology and paper. The student will explore patterns in the data and locate the maximum and the minimum. A part of the BLACKOUT! pages from POETRY, this page outlines the basics of sunspot plotting and solar rotation. This lesson plan allows students to explore the solar cycle by counting sunspots and finding patterns in plots of sunspot numbers, then forecasting the strength of the next cycle. The issue from March 9, 2000, discusses solar activity, the solar cycle, and the upcoming solar maximum. The issue from February 3, 2000, deals with Galileo's legacy, including sunspot-counting. The issue from January 6, 2000, introduces students to space weather, the phenomenon that will become more obvious at solar maximum. The issue from October 14, 1999, has information and activites about the most obvious feature of the Sun. A page of the latest available images from SOHO (Solar and Heliospheric Observatory) Extreme-Ultraviolet Imaging Telescope (EIT) and Michelson Doppler Imager (MDI), the Yohkoh Soft X-ray Telescope, the U.S. National Solar Observatory at Kitt Peak, the U.S. National Solar Observatory at Sacramento Peak, and the High Altitude Observatory Mauna Loa Solar Observatory. The Solar and Heliospheric Observatory team generates this daily index of pages of the latest solar images both from its satellite and from other observatories around the world. Radioheliograms, H-alpha images, magnetograms, and Calcium II images are available, among others. An index of hundreds of solar images, by date. Mostly H-alpha and white light images and magnetograms with a few others. This page from Windows to the Universe gives current solar images (SOHO/EIT, Yohkoh, coronameter, magnetogram, white light, Ca II, H-alpha, etc. ), measurements of geomagnetic activity (Kp, interplanetary magnetic field strength, solar wind speed, etc. ), and up-to-date views of the aurora from the Polar satellite. Designed for scientists, this page has links to nearly every satellite and program producing Sun-Earth connections data and images, including all of the above. An outreach version of the page (fewer links and more explanation) is also available. This image shows the "butterfly diagram," a figure that tracks the location of sunspots during the solar cycle, resulting in a pattern that resembles a butterfly's wings as the sunspots migrate equatorward on the Sun near solar maximum. Yohkoh soft x-ray images taken over nearly a solar cycle show the startling difference in the appearance of the Sun between solar minimum (the dark, inactive Sun on the right) and solar maximum (the bright Sun on the left covered with active regions). This Dynamics Explorer satellite image shows the southern auroral oval during the great geomagnetic storm of March 1989 (solar maximum period). Note the enormous size of the oval. A large collage of images dealing in some way with the solar cycle or maximum: the butterfly diagram, changing suns, the solar cycle diagram, the Solar Maximum Mission satellite, and the Little Ice Age during the Maunder Minimum, among others. A look at the outer atmosphere of the Sun -- the corona -- in this image shows definite (but usually invisible) changes throughout the solar cycle at the same time as the surface of the Sun changes visibly. This image combines changes in the Sun's appearance in H-alpha with a graph of the Wolf sunspot number, number of sunspot groups, and auroral observations.